Artists were asked to re-do a used doll house, to be shown at Art Zaanstad 2017. 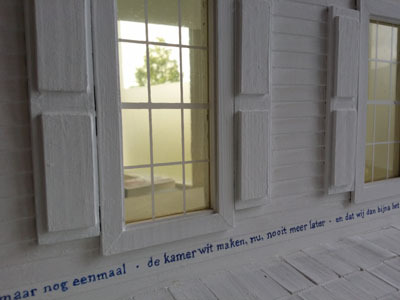 I painted mine all white and added a poem by Gerrit Kouwenaar called "Totaal witte kamer"(completely white chamber). To read the poem, one has to turn the revolving doll house.The rooms are all empty.